The acclaimed Signature Les Paul now in Pelham Blue! In the last decade, Joe Bonamassa has ignited a new passion for blues guitar, inspiring millions around the world with his original fusion of classic grooves and searing licks. Bonamassa’s extraordinary guitar skills have already earned him a fitting tribute from Epiphone—a signature Ltd. Edition Les Paul Goldtop. And now Bonamassa adds a new twist by introducing the Ltd. Ed. Joe Bonamassa Les Paul Standard Outfit in Pelham Blue. Bonamassa’s signature Les Paul Standard Outfit was designed in close cooperation with Joe and captures all his favorite design details from his collection of vintage 50s Les Pauls including a traditional 1959 neck profile and the “Patent Applied For” sound brought back to life with Gibson BurstBuckerTM pickups. The Epiphone Ltd. Edition Joe Bonamassa Les Paul Standard Outfit in Pelham Blue sets a new standard for affordable performance. 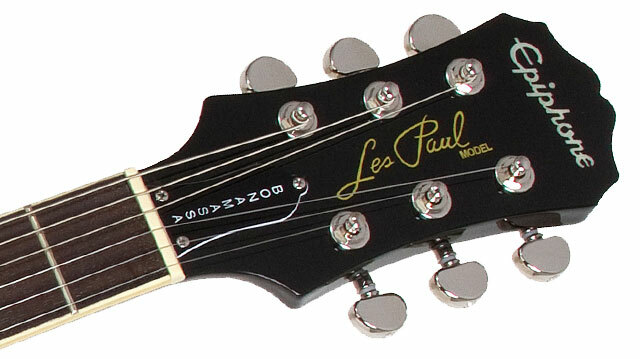 The iconic Les Paul profile is made with a solid Mahogany body with a carved Hard Maple Cap, a vital ingredient to the Les Paul’s unique combination of warmth and bite. The Mahogany neck has the Les Paul standard 24.75” scale with a 12” radius, a ‘59 Shape and a Rounded D-Profile that is glued in with a deep-set neck joint using premium TiteBond™ glue. The Rounded ‘D’ Profile, often referred to as "the baseball bat," feels beefy yet comfortable in your hands while adding warmth and sustain with its greater mass. Extending well into the neck pickup cavity, the long-neck tenon provides additional strength and stability to the neck and offers more wood-to-wood contact between the neck and body resulting in a sweeter tone and longer sustain. For his signature Les Paul Standard Signature model in Pelham Blue, Joe Bonamassa personally chose Gibson’s famed BurstBucker™ pickups. BurstBuckers™ replicate the sound of Gibson's original "Patent Applied For" pickups - the ultra rare hand-wound pickups that gave the original '59 Les Paul Standard its legendary sound and made it a favorite of blues fans like Eric Clapton, Duane Allman, and Jimmy Page. BurstBuckers™ have unpolished magnets and non-potted coils like the originals. The myriad of variations in the output and tone of original “Patent Applied For” pickups came from inconsistencies in winding the bobbins, a result of the lack of automatic shutoffs on Gibson's winding machines in the late 1950s. Seth Lover, who invented the humbucker, recalled that original “Patent Applied For” pickups were wound "until they were full." When two coils in a pickup have a different number of turns, that variation puts a little "edge" or "bite" on the classic humbucker sound. 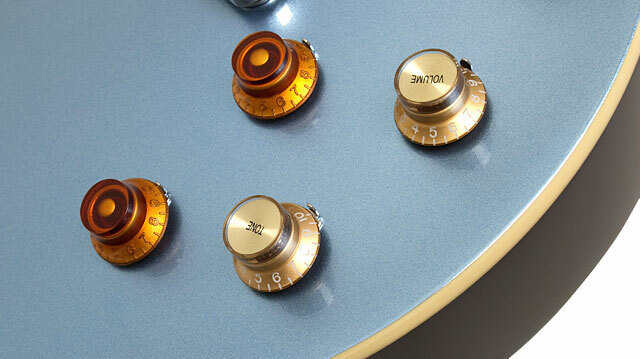 Gibson BurstBuckers™ bring that elusive and sought after tone back to life. The neck pickup on the Joe Bonamassa Pelham Blue Les Paul Standard is a Burstbucker-2 and is wound in the range of Gibson's '57 Classic. The bridge pickup is a Burstbucker-3 and is slightly over-wound with a hotter output for leads. In keeping with Joe’s original, the Ltd. Ed. Pelham Blue features a mismatched set of bridge/neck pickup knobs (just like Joe's), Epiphone's patent-applied-for LockTons™ Tune-o-matic and StopBar tailpiece, vintage style Nickel hardware, and premium 18:1 ratio Grover™ tuners. 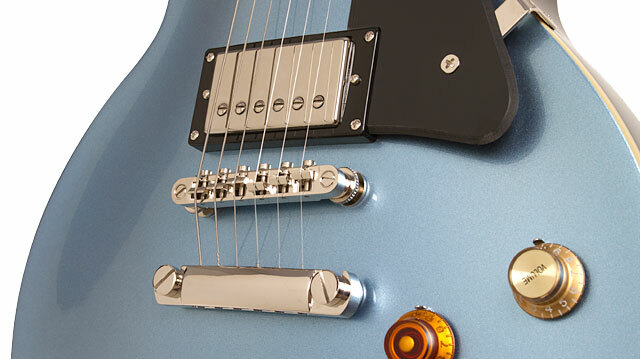 And , the Ltd. Pelham Blue has an Epiphone non-rotating ¼” output jack and Epiphone StrapLocks. 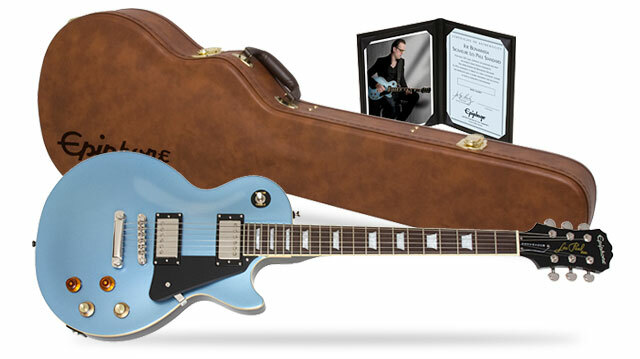 Each new Limited Edition Joe Bonamassa Les Paul Pelham Blue Outfit comes with a replica Lifton-style hardshell case and a Certificate of Authenticity personally hand signed by Joe Bonamassa. Combined with Epiphone's Limited Lifetime Warranty backed by 24/7/365 Customer Service, it's a one-of-a-kind package and a fitting tribute to an extraordinary musician.